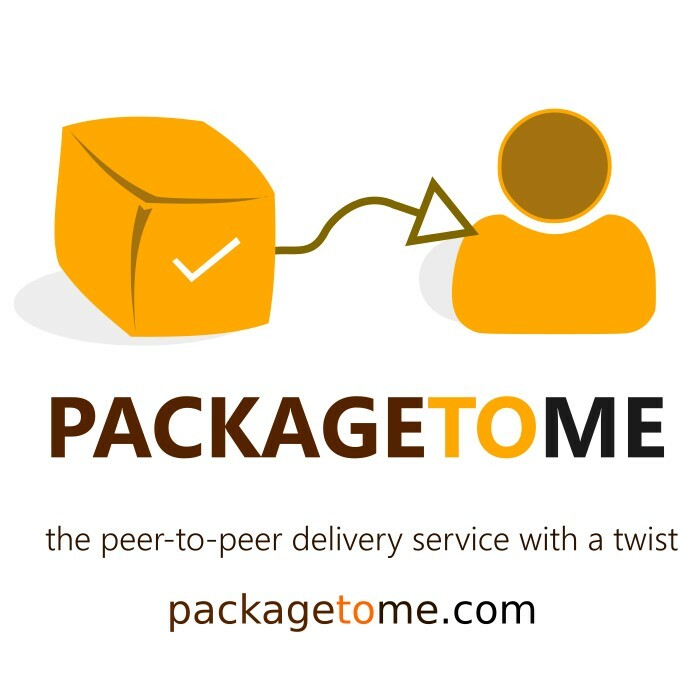 PackageToMe is the Peer-to-Peer Package Delivery with a Twist. What kind of twist? At the end, will throw in a few safety tips to keep in mind when using PackageToMe. We believe PackageToMe will revolutionalize how packages are delivered to folks in Ghana. Let’s walk you through the answers to the above questions. PackageToMe is not a courier service. Neither a package delivery company. What PackageToMe seeks to help with is connecting travelers with individuals who yearn to have an item on an online store, bought and delivered to them. Say you want the 200Gig MicroSD card. You have the money, yet you can’t get one to buy in Ghana. You list the link to the 200Gig SD card from Amazon to Package To Me. You add a few details such as how much you willing to pay any traveler who buys and brings it to you. A traveler headed to Ghana will get in touch, discuss and make arrangements with you about the item. The traveler buys the SD card, brings it to you, and then you simply pay for the cost of the item and any delivery cost you both agreed upon. Hundreds, if not thousands of Ghanaians travel to Ghana each day. Package To Me seeks to become the portal for travelers to find requested items they can deliver and earn some cash on the way. Package To Me is positioned to solve primary issues in our country related to Pricing of tech products and their Availability. Pricing & Availability: Ever noticed a product which sells for 100 Cedis on Amazon probably going for 250 Cedis in Ghana? The price difference can be attributed to many factors. Package To Me will make paying 250% for a product in Ghana a thing of the past. Isn’t PackageToMe going to kill Tech shops in Ghana? No. You want a laptop? There are a ton of varied headphones of all kinds within Ghana, for instance. Same applies to phone. Then, in what case would one need to use Package To Me? When the headphone needed isn’t available yet or won’t possibly be available, one can turn to Package To Me. Here’s a typical case which happened to us. I needed a Ubiquiti AP Mesh AC for our WiFi project. This is a basic router with extra features. Unfortunately for me, the device was released late in 2016 which meant almost none of the router shops I could reach out to in Accra had that particular device in stock. After a long search how to get the device, I was directed to a tech supplier who would charge 800 cedis per each item.The device cost just 450 cedis at the time. 800 Cedis per item (we needed 4) definitely was not a fee we could pay, assuming we even were slightly interested. Our solution led to the building of Package To Me to help solve the problem for hundreds if not thousands of people facing similar challenges. A journalist decided to buy and deliver the routers to us. We only had to pay for the cost of the items on Amazon at the time. We saved some 1,200 cedis in the process and saved our project as the device was critical to the project’s launch. Package To Me exist to simplify package deliveries, riding on the fact of many travelers headed to Ghana each day. If each traveler could carry one simple item to a requestor, that would mean a difference. How to Use Package To Me? For Travelers: Headed to Ghana next? Done packing yet you notice you have some space to spare? 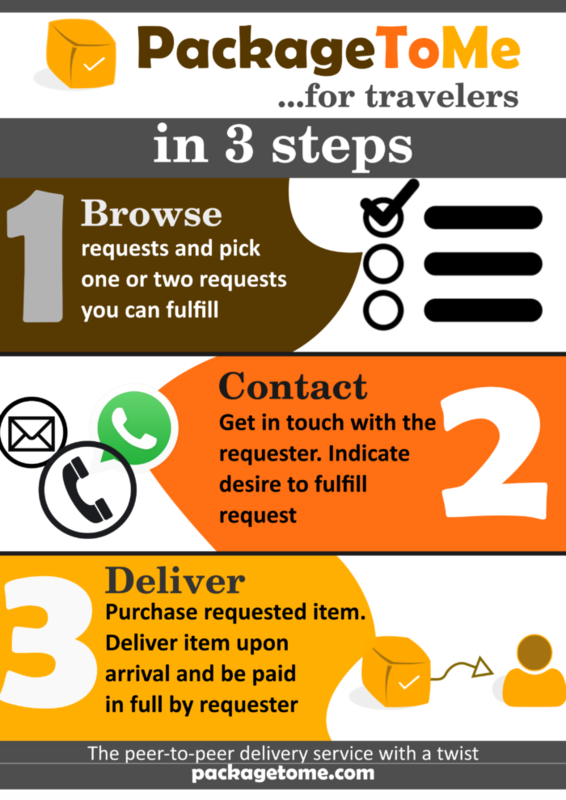 Get in touch with the requestor, and begin discussions about the cost of delivery (how much you’ll charge should you buy and deliver the item), where to meet and deliver item etc. After concluding requestor is serious about the request, purchase the item from the provided link (product could be on Amazon). To keep communications as transparent as possible, you should the receipt to the requestor. This way, the requestor knows exactly what was purchased and prepares for it. You should share pictures of the item in its packaging etc with requestor as well. Do not request money from the requestor. You are to buy the product yourself and THEN upon physical delivery when in Ghana, take your money in exchange. You may decide to deliver the exact package as received from Amazon or the online shop to the requestor. However, if the packaging of the item makes packing into your luggage cumbersome etc, you may discuss with the requestor and make adjustments, perhaps removing items from their original packaging and repackaging for simplicity and safety of traveling. Meet the requestor when you arrive in Ghana in person. The requestor pays for the cost of the item + any already discussed delivery cost. You hand over the package. It is a done deal! How much space do I need? As little as possible. In fact, your jeans front pockets are considered ‘space’ to us. You could fit an SSD or a MicroSD card in that pocket, which WON’T in any way impact your load, however would mean a huge difference to the requestor. At the end, you could charge 15-20$ for delivery of an item which put just in your jean pocket for free. 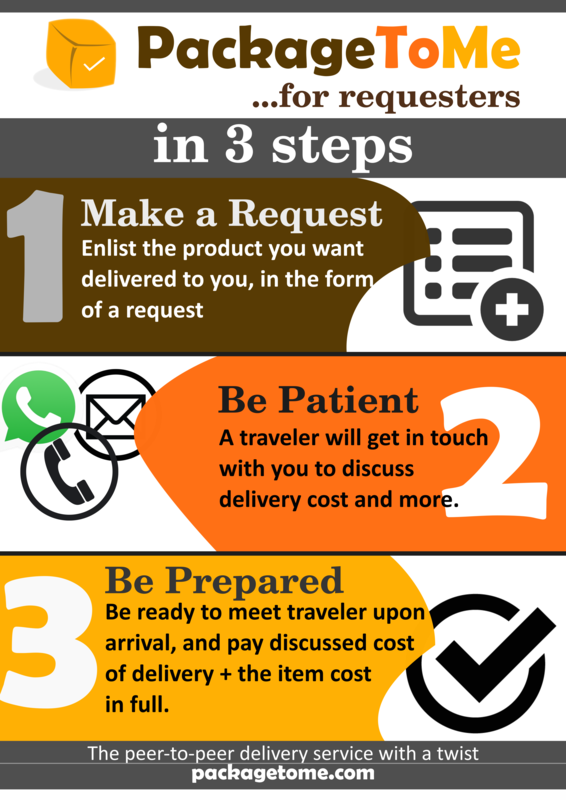 A traveler would get in touch if they can fulfill your item request. Remember: The traveler would purchase the item with their money and come for the cash when they arrive in Ghana. Do not send money ahead of time. It is favor a traveler would be doing you. Be prepared to pay IN FULL upon delivery, the cost of the item, plus any agreed delivery cost. No TRICKS. The traveler would ONLY give item after successful FULL payment. Have questions related to what PackageToMe is and any reservations? Please email us at packagetome [at] khophi [dot] co.
You can leave a thought in the comment section below.